Check out this controlled avalanche released by @telluridehelitrax. This snow blast went on to hit a huge pond. @OakleySkiing shared this on Instagram. We recently spotted this unusual creature striding across the snow in Fieberbrunn. Not what you expect an adult to be wearing! "Putting a pocketbike 50cc Engine on a Snowboard is fun!" writes Mathisox on YouTube. Watch Travis Rice leaps into Corbet's Couloir in Jackson Hole. It's been over 10 years since it snowed in Las Vegas and then this February it's snowed three times with fairly significantly amounts too. This was Thursday night in Las Vegas. Last week Carolle Cote posted the images below showing some deep snow at her home in Las Vegas. Launched by Australian brothers who love surf, snowboard and skateboarding. It's the ultimate carving sled. It's not a quick release product, this Snoogee has been eight years in the making. It will retail at US $350 and is aimed at adrenaline junkies looking for a new snow fix. "We hit the slopes of Wildkogel Mountain in Austria, building jumps to get air and carving powder," one brother Ben Bateman says. "I can assure you, no other sled on Europe's sled runs is as versatile or high performing as the Snoogee," Ben claims. Check it out below in the video. Ski effort of the day goes to this little guy. 44- year old James Williams will be taking part in the London marathon on April 28th in full snowboard gear - including carrying a snowboard. "I decided to do this because it combines two of my passions - snowboarding and running," he said. "I'll be wearing the full snowboarding kit including ski jacket, helmet, goggles and snowboard boots and of course carrying an adult snowboard which weighs about 5kg. "I've learnt that it's also pretty unwieldy to run with." He is aiming to get into the Guinness Book of Records - the current fastest time in snowboard gear is five hours 46 minutes. "Having done a couple of practice runs, including a 10K race on February 3, this is going to be a tough target," he said. Speed skier Jan Farrell dropped his ski pole as he left the start gate. But he wasn't phased by it. Instead, he managed to maintain his balance and continued with his straight line down the mountain. Take some tips from the experts at Ben's Bus who've done the journey to French mountain resorts more than enough times. The French split up school half term into 3 zones, spreading the load this year from 9th February - 9th March. While it helps on the slopes, it means four Saturday-transfer days of relatively heavy traffic. Take plenty of food and water, whether you're on a shared ski transfer or driving yourself. It's not unusual for an airport transfer to Tignes, for instance, to take 5 or even 6 hours instead of the usual 3.5 hours. Between 11am and 3pm the roads climbing the mountain can move at a snail's pace. If you're leaving the resort, try to do it before 07:30 or after 14:00. The worst hotspots are between Bourg St Maurice and Moutiers, the Rocade Sud ring road south of Grenoble and the Lyon and Chambery peages. Ben's Bus drivers know the cheeky short cuts and how to avoid the bottle necks. Consult traffic websites before you go-go to find out exactly where there's road congestion. Don't rely completely on Sat-Nav as it might try to take you across mountain passes that are closed in the winter. The easiest way to avoid the rush and crowds is to take a ski holiday in January or March. For more expert tips from the transfer service, check out Ben's Bus website. If you see a man in a dog collar snowboarding down the slopes of your local snow centre at the end of the month, don't get in his way. The Reverend Steven Young - aka the snowboarding vicar - is planning to do a run on his board at all six UK indoor centres in one day to raise money for his local hospice. That's no mean feat as they range from just outside London to Glasgow. The vicar of St Michael's in Mill Hill, north London, will have to cover 478 miles over the day. The snow centres have given him a free pass. All funds raised will go to the North London Hospice where Mr Young is Anglican Chaplain. If you want to help, click on the link to the vicar's Just Giving page. Burton has released a snowboard with graphics and shape inspired by the legendary rock band's first album. The group is commemorating its 50th anniversary this year. "When it came to honouring one of the greatest rock bands of all time, we went beyond just graphics and designed an entirely new board," said a Burton spokesperson. "Named aptly after the single, Misty Mountain Hop, we made it fast and hard-charging with a shape inspired by the iconic first album - Led Zeppelin. We spotted this short clip on Instagram today posted by SkiBeat. The big question is "How deep is the snow in Val d'Isere?" Regular PlanetSKI reader, Rod Frazer, is out on the slopes in Scotland - this time it's Cairngorm. Very, very cold, in the case of this dish served at a gourmet restaurant in the Austrian ski resort of Ischgl. We're happy to be corrected if we're wrong but we believe it is liquid nitrogen being poured from the bottle that creates this freezing fog effect. The dish, called "Refreshment of oysters and champagne" was created by one of Austria's top chefs, the award-winning Martin Sieberer at his Paznaunerstube restaurant. It's certainly an impressive sight. Nitrogen is a gas which becomes liquid only when it is cooled to -196 Celsius. The cloud that forms as it leaves the bottle is not nitrogen but condensed water vapour. It's thought that liquid nitrogen was first used as a ‘cooking' technique by chef Heston Blumenthal at his Berkshire restaurant, The Fat Duck. A source tells PlanetSKI that Blumenthal has eaten at Sieberer's restaurant in Ischgl and was rather impressed. With all 12 courses - and the home-made chocolates that followed. It wasn't all about the food. Just 3 weeks after giving birth to her second son, Cooper, alpine skier Chemmy Alcott returned to work with baby in tow. Chemmy is filming in Åre in Sweden with Graham Bell and Ed Leigh who co-host BBCTV's #SkiSunday. "3 weeks ago I gave birth. Today I am back with the #skisunday crew shredding the mountain, filming and loving life in the spectacular @skistar_are mountains. I know I am lucky that my body can handle this. I know that not everyone can return so quickly to work. The human body continues to wow me daily. I love that I can have baby Cooper with me on this epic trip. And so grateful to @fayebck88 for taking care of him whilst I take care of me! I am sitting in a toilet booth up the mountain as I write this expressing milk so that I can try to juggle breastfeeding and work. It's not always as glamorous as the images I post but you just have to make things work! 😉 "
Chemmy Alcott and Dougie Crawford now have two sons Lockie and Cooper. Lockie turned 2 a few days before Cooper was born on 16th January. Professional skiers and snowboarders rode down the mountain and have posted of their exploits. It took place took place on the south side of the Pu‘u Poliahu hidden from view from rangers. The Office of Maunakea Management says it is "very disturbed" by videos showing three people skiing and snowboarding on the dry slopes of the mountain. "First and foremost, this act was disrespectful to Native Hawaiians and to everyone who considers the mountain sacred," said Stephanie Nagata, director of OMKM under the University of Hawaii at Hilo, in a statement. "One of the first acts by Kahu Ku Mauna in 2001 shortly after its creation was to stop vehicular access traffic on the pu‘u because it is a sacred site." Under the proposed rules, snowboarding and skiing with proper equipment would be allowed when snow is present. But doing the same on dry land would be prohibited. You might be looking for a change of scenery and a different mountain range for some ski touring? Check out this video from Iain Martin of Skipedia as he tackles some of the peaks in the Atlas Mountains in Morocco. He reached challenging heights at Toubkal (4,167m), Akoid (4,010m) and Timzguida (4,090m). HOW MANY PAIRS OF SKIS DO YOU NEED? If your name is James Cove, you are the editor of the PlanetSKI and about to live Innsbruck in Austria for the next 3-months with a pass to every single ski resort in the Tirol (90+) then the answer is seven. With the whole range of different resorts and conditions ahead it seem he wants the right tool for the job. "The Factions are my powder ski for the deep fluffy stuff. They are wide under foot and give plenty of flotation," said James. "However they ski like a couple of barn doors on the piste, so that's where the next three pairs come in." "The Rossingnol Heroes are a fabulous all-round on piste ski. Next are my long turn GS race skis, they are stif as you like and take no prisoners - I only take them out when I'm in the mood." "Next up my favourite piste ski of all time - the all-conquering Atomic Redster. Accept no substitute." "Mine are short at 162 but it's the perfect length for me. It's actually the model from 3 or 4 years ago, but I don't want to change it. Everytime I ski my Redsters I feel like I'm out with an old and very reliable friend. And one who pushes me to the limit." "Then it's the Atomic Vantage which is billed as an all-mountain ski but my version (100 underfoot) it perhaps better in the powder and that is why I need the next ski, the Blizzard Bonefide. It is slightly better on the piste (98 underfoot) and is undoubtedly my favourite all-mountain ski of all time." Now those able to count will notice that is only six pairs in the photo, and the earlier answer from James was seven. Well, that is because his touring skis are in a friend's garage in Verbier and will have to be collected. And if the truth by told he probably should say "eight" as James intends to do plenty of cross-county skiing too over the next few months. He is living in the Tirol after all. Who was it that said skiing is just a series of linked recoveries? How many can you spot here? Can there ever be too much snow? 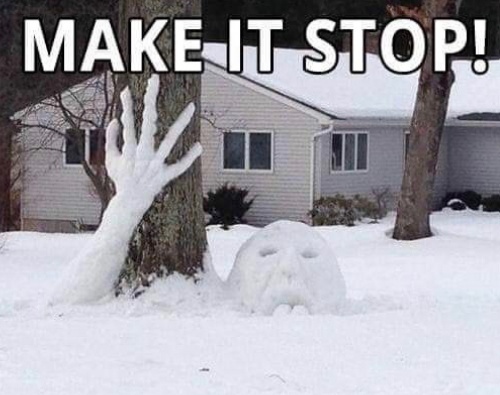 'Make it Stop' - In deep snow! Who's got that Six Nations feeling? There's a lot of chat about the excessively cold spell in the US at the moment. An unusually cold Arctic air mass, called a polar vortex, is responsible for the severe temperatures, which in many areas of the US have plunged well below -18ºCelsius. Here's a gif from NASSA showing the Arctic air mass moving southwards, the ultra cold temperatures are depicted in purple. The lowest temperatures are shown in purple and blue and range from -40º Celsius (also -40º Fahrenheit) to -23º Celsius (-10º Fahrenheit). As the data series progresses, you can see how the coldest purple areas of the air mass scoops down into the US. We've pulled together some whacky images and videos demonstrating the extremely cold conditions that are currently being experienced in the US. Watch what happens to this woman's wet hair as she ventures outdoors in the extremely cold weather. Watch how boiling water instantly vapourises when tossed into the air in extremely cold conditions. The combination of hot water, cold, dry air, and high surface area causes most of the tossed boiling water to evaporate before it hits the ground, and the tiny droplets that don't evaporate will freeze into ice crystals while still in the air. Evaporation will be slower if the water is not hot enough. The air temperature in Michigan in the video below was -34.4ºC. SO HOW WOULD YOU CLEAR THIS ROOF? Kerry Countryman was on holiday in January when she came across the Canyon General Store in Yellowstone National Park covered in about seven feet of snow. Watch how the snow was expertly shovelled off in fridge-sized chunks of packed powder, and how each slab carefully slid down the rooftop. KEEP THE SNOW DANCES GOING FOLKS! As February starts the snow continues to fall. But will it be as good as last winter?. According to our friends over Skiworld this is what happened in 2018. The start of each month's Skiing Secrets showcases a few videos that have caught our eye. And we'll be posting more later today so do check back.